Classic mirrors, like Oval Mirrors, are the preferred choice when you want to design your space with a hint of vintage aura. 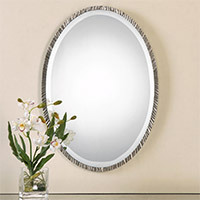 Apart from their functional traits, oval mirrors serve as very useful decorative items when chosen and placed sensibly. Reflecting natural and artificial light, oval mirrors create an interplay of shadows and reflections that cannot be replicated. As home décor specialists, we have painstakingly explored this niche. Our inventory is regularly curated to ensure you get the best deals in this segment. You get to choose Oval Mirrors with different personas, ranging from vintage selections to those with exotic materials and contemporary styling. You can choose mirrors in brushed nickel finish or those with oil rubbed bronze, or all-metal mirrors for adding a flavor of offbeat to the surroundings! Oval Mirrors There are 24 products.